Suggested Use: 1 tablet daily or as directed by a health care professional. vein-related conditions, such as hemorrhoids, easy bruising, nosebleeds, and venous insufficiency. the bioflavonoid rutin, an antioxidant, reduces DNA damage and cancer, and is thought to strengthen the walls of blood vessels. thymus concentrate, from calf thymus, contains a variety of thymic proteins, some of which regulate parts of the immune system. 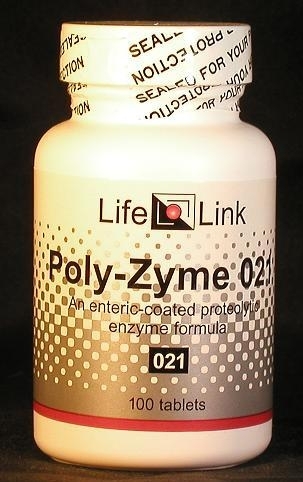 The mechanism of action of Poly-Zyme 022 and 023 is not well understood, but is thought involve the cleaving of substances on the surfaces of cancer cells and viruses. Caution: Individuals taking warfarin (coumadin) should not use these products without consulting a physician.